Aren’t they just so cute? I amaze myself. So the new diet thing is going okay, we are still sometimes (often!) running out of things to eat, like how many different ways can you prepare chicken breasts and potatoes? But there have been some successes. The donuts were made for the annual New Year’s Day feast at my friend LuckySevens’ house. I wanted there to be a dessert that was safe for the Captain (and Mr. LuckySevens, who is celiac). 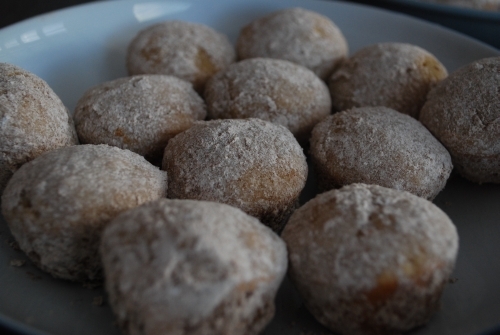 They turned out really well, although they do have that quinoa-flour taste that makes them kind of beany in flavour. It’s subtle, but you can tell that they aren’t your usual donuts, so I figured no one else would want to eat them. At the party, after the desserts were laid out, I went down to the basement to notify the Captain. There were around 10 kids down there engaged in either trying to kill each other with pillows, or threatening to run and tell on those involved in the pillow war. I said to the Captain, in a normal tone of voice, that the donuts were out if he would like to come and get one. Actually, I only got as far as, “Captain, the donuts are out –” before I was bowled over by a mad rush of kids screaming, “DONUTS! !” at the top of their lungs. It was just like a cartoon when a big crowd rushes by, then the smoke clears and you see the heroine lying dazed in the road. Those kids were ON IT. Luckily Sir Monkeypants saw the crowd coming and nabbed a donut for the Captain. The rest were gone in SECONDS. Seriously. Every kid grabbed one and gobbled it right up. So I would have to say that that’s the ultimate seal of approval right there – just as snarfable as real donuts! Seriously, I do take it as a huge compliment and a sign of success. Mmmm … looks yummy! Can you Fedex some over? Holy crow those look delicious. I would be in on the donut stampede, too! You pretty much rule the kitchen! I would love to try making donuts. Do you have a donut pan? Yes, I got it at Kitchenalia in Westboro. 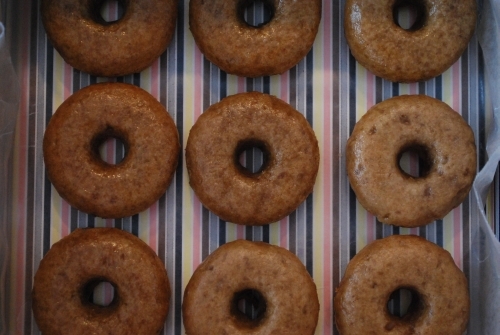 It makes baked donuts, sort of like little cakes and then you can glaze them. Mmmmmm. OMG, you made DONUTS? I’m in awe. Wow, that is awesome. Love the photos. and LOVE that they turned out ok. I’m always holding my breath with the dairy-free baked goods – I’ve got about a 50/50 track record and even the same recipe can turn out badly on a different day. YAY for donuts! On the one hand, it’s awesome that the kids ate them. On the other hand, don’t you kind of want to say ‘get out of here, you can eat the floury stuff?’. Either way, you totally rock. You are awesome and this post made me laugh out loud. Glad the donuts worked. Awesome! Both the donuts and the min-donuts look deliciously yummy. Also, Kellog’s is launching a new gluten-free Rice Krispies cereal (made with brown rice) this month. No nuts in the ingredients list and no “may contain traces of nuts” warning on the label. Ingredients are whole grain brown rice, sugar, salt and BHT (whatever that is), plus some vitamins and minerals. I have a sample box that you’re welcome to if you’d like to try them. This is great news! I had heard that they were not going to sell them in Canada (they launched in the US back in May). Yay yay yay! The return of Rice Krispie Treats! I’ll watch for them at the store. Yet another reason to road-trip to Ogdensburg? They’re so pretty! How do you manage to make food that tastes good AND looks pretty? I do the tastes good part (usually) but the looking pretty part often eludes me. Actually, my general rule of pie-making is that the uglier the pie, the yummier. I usually have a real problem with the presentation part. I guess gluten-free just agrees with me! YOU MADE FRAKKIN DONUTS?!?!?! i bow to your awesomeness. so glad they turned out so well. i must explore this donut pan thing. the jb would totally love that! LOL! They look awesome! You should be proud!